Here it is…the final issue of Hawk and Dove. Our avian avatars have teamed up with Xyra to make sure they survive the prophecy that leads to their deaths. Issue #8 is pretty much a pay-off issue for the story, in a sense that this is where all of the action happens. They storm the cult’s headquarters–conveniently located in Washington, DC just like them. 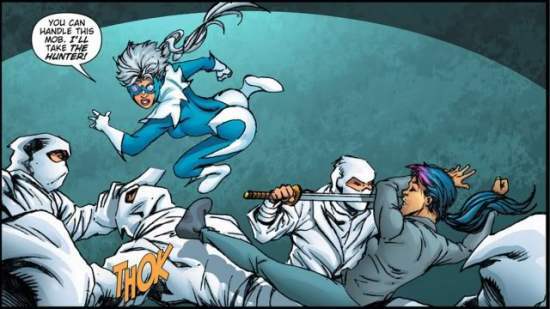 Hawk creates a diversion against the cult, which is a bunch of ninjas clad in white just like Storm Shadow, giving Dove and Xyra breaking in on the other side of the building, fighting even more ninjas. D’Khan, the avatar of flying lizards (which seems like a natural predator of birds if they were to have existed) finally appears and battles the two women. Dove gets the best of him, but can’t bring herself to kill him which D’Khan takes advantage of and beats the snot out of her. Eventually Hawk catches up with them and he has no qualms killing D’Khan. At no point does Hawk ever wind up in a point where he would kill Dove, so either they forgot about that part of the prophecy or it turned out to just be false. Xyra thanks the duo for their help, saying that they will always have an ally between her and her cult. The book ends with Hank and Dove sitting on a rooftop, going over the last eight issues and then getting back to work stopping criminals in DC. It’s kind of a flat ending, as the weird relationship tension between the two is never addressed (let alone resolved). Liefeld had some help on the art by longtime collaborator Marat Mychaels, and it’s amazing how the two draw so similarly. This was the first issue of the series where I had strong feelings negatively about the art. There were a few pages that felt like they were scanned at too low of a resolution and they tried to overcompensate with over the top coloring. That, and there was one page where it’s revealed that Dove and Xyra have exactly the same haircut/face and it looked like they were twins. As a whole, I enjoyed the Hawk and Dove series while it lasted. Was it groundbreaking and a classic? Definitely not. But by no means it wasn’t a fun read. It’s pure super hero mayhem and nothing more. I picked up this book solely for the fact that I’ve always liked the characters, an appreciation of Liefeld’s art, and really liking his run on the title back in the early 1990s, before he blew up during his New Mutants/X-Force phase. Maybe with some stronger writing, this book would have lasted longer. Hell, if it was Geoff Johns and Liefeld’s book, it would have been a blockbuster seller. But for what it was, I enjoyed it and I can’t wait to see the characters surface again. This entry was posted in Uncategorized and tagged comics, dc, dove, hawk, hawk and dove, marat mycheals, new 52, rob liefeld by Chris. Bookmark the permalink.